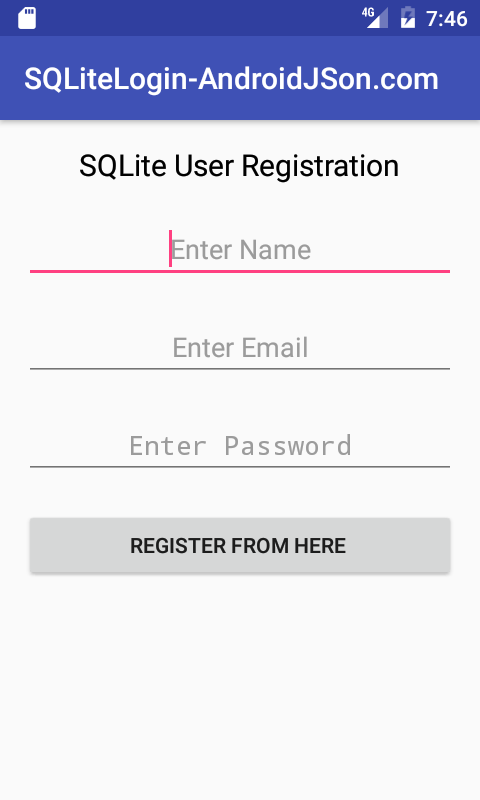 How to create a complete local User Registration and Login System in android application using SQLite database with user profile dashboard feature example with source code. In this tutorial we would going to create a complete user Sign-UP and Log-In system including user profile which is displayed after successfully Login system. 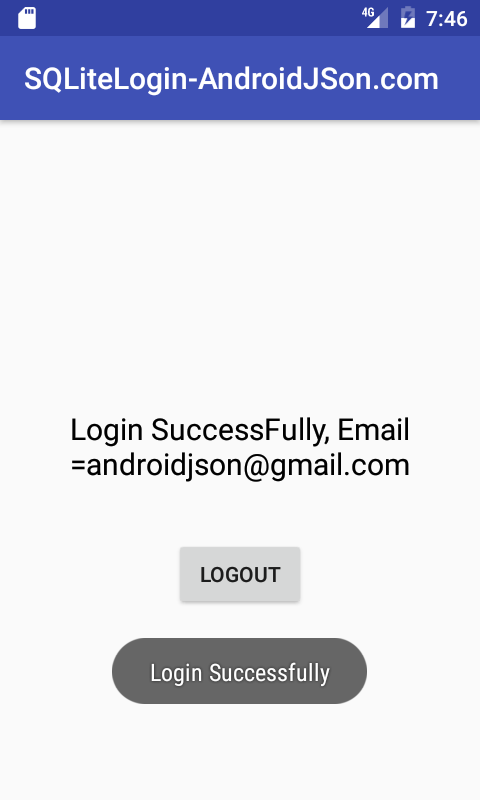 So here is the complete step by step tutorial for Android Local SQLite Database User Login Registration System Example Tutorial. If successfully Login – GoTo Dashboard page and show Login user E-Mail on activity screen. //Adding click listener to log in button. // Calling EditText is empty or no method. // Adding click listener to register button. // Opening new user registration activity using intent on button click. // Login function starts from here. // Opening SQLite database write permission. // Adding search email query to cursor. // Storing Password associated with entered email. // Calling method to check final result ..
//If any of login EditText empty then this block will be executed. // Checking EditText is empty or not. // Getting value from All EditText and storing into String Variables. // Checking EditText is empty or no using TextUtils. // Checking entered password from SQLite database email associated password. // Going to Dashboard activity after login success message. // Sending Email to Dashboard Activity using intent. // Creating SQLite table if dose n't exists. // Method to check Email is already exists or not. // Empty EditText After done inserting process. // SQLite database build method. // SQLite table build method. // Insert data into SQLite database method. // If editText is not empty then this block will executed. // SQLite query to insert data into table. // Closing SQLite database object. // Printing toast message after done inserting. // This block will execute if any of the registration EditText is empty. // Printing toast message if any of EditText is empty. // Empty edittext after done inserting process method. // Method to check EditText is empty or Not. // Checking Email is already exists or not. // If Email is already exists then Result variable value set as Email Found. // Calling method to check final result and insert data into SQLite database. // Checking whether email is already exists or not. // If email is exists then toast msg will display. 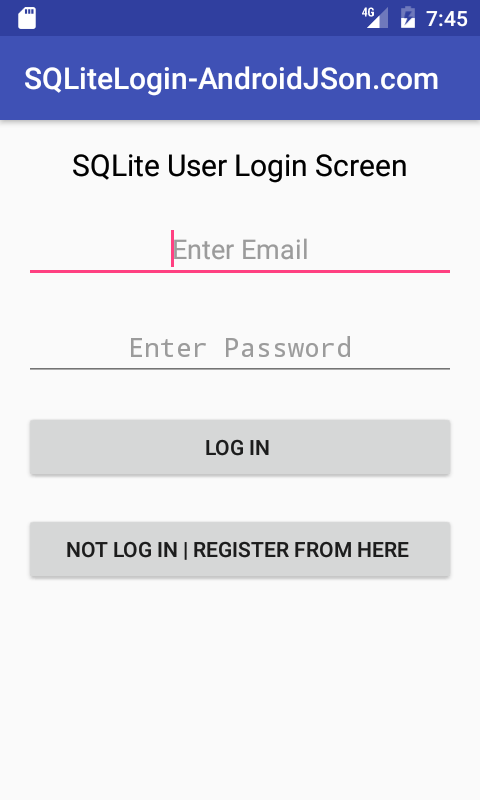 // If email already dose n't exists then user registration details will entered to SQLite database. Code for activity_register.xml layout file. // Receiving User Email Send By MainActivity. // Setting up received email to TextView. // Adding click listener to Log Out button. //Finishing current DashBoard activity on button click. Code for activity_dashboard.xml layout file. * Created by Juned on 3/13/2017. Code for AndroidManifest.xml layout file.